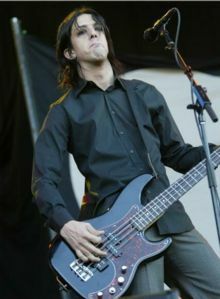 Jeordie Osborne White (born June 20, 1971), also famously known as Twiggy Ramirez, joined the Nine Inch Nails touring band in 2005 for the With Teeth era. White doubles bass and guitar duties during live performances and has helped with in-studio work. He and Aaron North co-star in a web comic known as Squires Of Dimness. He appears in the NIN music videos for "The Hand That Feeds" and "Survivalism". White was most famous as the bass player and major contributor to the band Marilyn Manson, going by the stage name Twiggy Ramirez. He was responsible for writing a large portion of the band's songs. He left the band in 2002 but re-joined in early 2008. In 2002 White replaced Paz Lenchantin as the bassist for A Perfect Circle. In an interesting exchange of members, he was recruited with ex-Nine Inch Nails bassist, Danny Lohner, who was assuming guitar duties in APC, and joined drummer Josh Freese, who now acts as NIN's touring drummer. White contributed to the writing, recording and touring phases of A Perfect Circle. White is one of the many artists to take part in Josh Homme's Desert Sessions, which is best described as a drug-tinged superstar jam-band retreat. Many artists have collaborated on these sessions, and they have seen numerous releases. White also takes part in this band with Zach Hill (Team Sleep, Hella), and Chris Goss (Kyuss, Queens Of The Stone Age producer). This page was last modified on 30 May 2013, at 03:21. This page has been accessed 92,807 times.